I photographed what I think is Erithemis vesiculosa on Key Largo, and would like to send you a pic to confirm or correct the ID. Would that be ok, and if so, to which address? Great gallery, great shots, helped to ID several that I have shot while birding. There are so many dragonflies in yard every day here in northern FL., as well as all types of wasps, yellowjackets, etc... I've never seen so many. Something is going on???? I've shot some real beauties in Flagler County. 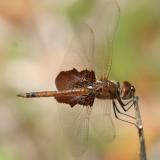 I can't hyperlink to my photostream here, but go to Flickr, search for Zoom Lens, and look at my Dragonflies sets. Debbie, Carolina saddlebags can be found across the east coast from Texas and Florida up through New England. I found what I believe is a Carolina Saddlebags, just wondering if they are only native to Broward County. I live in West Volusia County. I was just talking to a friend last night and he said one of the local colleges had genetically modified dragonflies. why? Not sure, perhaps to eat mosquitoes. I'd like to know and am very curious about the impact it might have on the environment. If anyone has info. Please contact me! Thanks for helping me identify a Carolina Saddlebags. 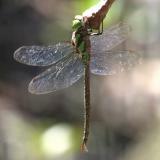 Beautiful (the dragonfly and the photo). we live in west broward county and today we noticed our back yard was filled with thousands of bufferflies. What would be the reason for the large swarms? Amazing photographs. Thank you for sharing these. Great gallery. Dragonflies are beautiful creatures for sure. Spectacular! Never seen anything like these, and you've even identified them. A revelation to me. Thanks for the posting.